Behind an un-prepossessing lean-to, now housing a bin store, at 97 Redcliff Street is a surviving fragment of medieval arcade belonging to a wealthy merchant’s house. Most passers-by could be forgiven for not noticing this rare survival of medieval walling in the City, heavily disguised as it is. Moreover, they could easily miss another section of wall to the rear of the same plot, where further medieval fabric, albeit much altered, can be seen from Redcliff Backs. These walls are believed to belong to the great house of the Canynges family, who dominated the political and economic life of Bristol in the 14th and 15th century, and were major benefactors of St Mary Redcliffe church. The younger William Canynges (1402-1474) was mayor of Bristol five times, and is reputed to have entertained the first Yorkist king, Edward IV, at his great house in 1461. The house stood until 1937, when much of it was demolished, and various antiquarian records record the former ornateness of it in some detail, including photographs and drawings. The hall was richly decorated, and had a stunning carved four-bay, arch-braced roof springing from corbels shaped in the form of angels. Drawings of 19th-century date show a gallery along the south side of the hall, and an altar and religious scenes painted on the walls, suggesting use as a chapel. Set further back from the street, a possible parlour room had a fine late 15th or 16th-century pavement, which was removed in 1913, and displayed in the British Museum. A long through-passage connected the rooms of the house, and courtyards, possibly separated by ranges comprising kitchens, extended back (west) from Redcliff Street. At the extreme western end of the plot, near to the 15th-century riverfront, was reputed to be Canynge’s Tower, described by William Worcestre in around 1480 as a ‘very beautiful building’ with four bay-windows, and measuring 18.3m x 13.7m (60ft x 48ft). This may well be the structure still visible from Redcliff Backs. Later medieval docks and quaysides extended towards Canynge’s Tower and the line of the 15th-century waterfront, which runs approximately along the modern-day line Redcliff Backs. In all, some 50m of land was reclaimed from the river between about 1200 and 1450. Timbers, and well-preserved organic remains from these excavations have enormous potential to tell us about diet, industry, economy and trade from the suburb in the medieval period, and it is hoped the publication of the Archaeological Assessment will give new impetus to the publication of the group of Redcliff Street waterfront sites excavated in the 1980s. References: Bristol Know Your Place website; Jones, R. H. 1986 ‘Excavations In Redcliff 1983-5: Survey and Excavation at 95-97 Redcliff Street, Bristol, an Interim Report’. Published by City of Bristol Museum and Art Gallery. Monument Series 2: plumbing the depths, and the archaeology of the archaeologists, at the Roman Baths in Bath. Earlier this year I had the great privilege to meet one of the greatest archaeologists of the modern era, Professor Sir Barry Cunliffe, during my work with Cotswold Archaeology, who were working with Bath and Counties Archaeological Society (BACAS) and The Roman Baths Museum on the Archway Project. The project aims to create a new Learning Centre and a World Heritage Centre by revealing parts of the bathing complex that were hitherto inaccessible by the public. The area, which currently lies immediately to the south of the area open to the public (specifically the Kings Bath and Circular Bath) was originally excavated by the Victorians, who created a warren of cellars in the spaces below York Street and Swallow Street. The Roman archaeology, which includes a dry sweat room (Laconicum), plunge pools and a possible running track or exercise area in the southern part of the bathing complex, was exposed and noted at the time, but not recorded to modern standards. Since then a number of small archaeological excavations have been carried out, the most notable by Professor Sir Cunliffe from 1963 onwards. Cotswold Archaeology were commissioned by the Roman Baths Museum to work with volunteers from BACAS to make the first comprehensive record of all of the structures and archaeological deposits within the space. 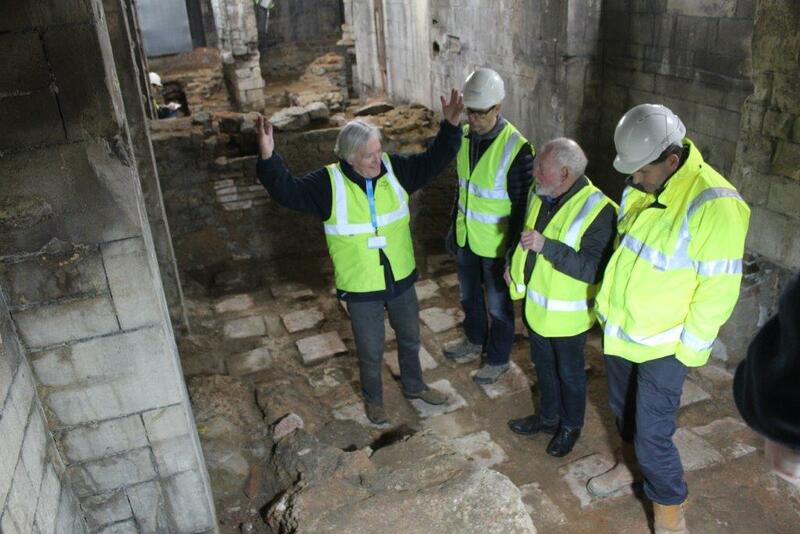 The working included re-opening some of the earlier archaeological trenches, and removing some intrusive modern deposits, to check the accuracy of some of the earlier records and to answer a number of questions regarding the layout and use of this part of the baths. Laser scanning and 3D photography (photogrammetry) techniques were also used to make highly accurate 3D models of the space as it was found in 2018. The Roman Baths Museum also commissioned a series of educational films documenting the archaeological process, which will be used in the new Learning Centre. The brick cones once synonymous with the glass industry that thrived in Bristol from the late 17th century have now all but disappeared. In fact, this example from Prewett Street, near St Mary Redcliffe Church, represents the only remnant of the historic industry that survives above ground, and yet extraordinarily is the site which we know least about. Now a restaurant, attached to a hotel, by 1812 it was used as part of H and T Proctor's fertilizer factory. However, its origins, ownership, and what types of glass were made here are not known. The cone structure itself, which first appears on a map of 1780, was reduced to the tops of the annealing arches in its conversion to a restaurant in the 1960s - the form which you can see it in now. Numerous factors brought the glass industry to Bristol in the 17th century, including the ready availability of coal to fire the furnaces, raw materials such as sand, limestone, red lead and kelp either locally sourced or imported (the latter already coming in from Ireland for soap making), and the strong established trade links from the port. Trade in glass bottles and window glass was established before the end of the 17th century with New England, Virginia, Portugal, Spain and northern Europe. The importation of sugar, on which Bristol came to depend, led to a growth in liquor distilling and this, together with existing trades in wine and locally produced beers and ciders, provided ready markets for glass bottle manufacturers. The deepening and widening of the River Avon to make it navigable to Bath by 1727 also stimulated further interest in glass making in Bristol, enabling the manufacturers to supply bottles, drinking vessels and window glass safely to ready markets in Bath. By the 1720s there were at least twelve glasshouses in the City, and before the end of the century at least sixteen had been established. However, the impact of wars with France and America, and the eventual declaration of independence by the latter, saw the Bristol glass industry contract to about a quarter of its previous size by the end of the century, and the consolidation of much of it by Jacob Wilcox Ricketts, who brought together a number of the Bristol glasshouses and continued manufacturing glass into the 19th century. In this context, the reasons for the demise of the Prewett Street site for glassmaking by 1812 seem clear, and make its survival all the more remarkable. However, its origins and history remain, for now, shrouded in mystery. References: Bristol Know Your Place website; Witt, Weeden & Schwind 1984: Bristol Glass. Published by Bristol Museum and Art Gallery.